On 10 October 2015 at 10:04 local time (EEST) in Ankara, the capital city of Turkey, two bombs were detonated outside Ankara Central railway station. With a death toll of 109 civilians, the attack surpassed the 2013 Reyhanlı bombings as the deadliest terror attack in modern Turkish history. Another 500 people were injured. Censorship monitoring group Turkey Blocks identified nationwide slowing of social media services in the aftermath of the blasts, described by rights group Human Rights Watch as an "extrajudicial" measure to restrict independent media coverage of the incident. 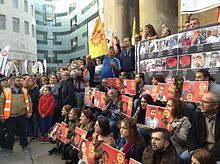 The Radio and Television Supreme Council (RTÜK) announced a temporary ban on all press coverage of the bombings following a request by the Prime Ministry. Monitoring group Turkey Blocks identified intentional slowing, or throttling, of the Twitter and Facebook social networks beginning some hours after the attack. An official claimed at the time that internet problems were "due to heavy use," although the practice of internet throttling for "peace and order" became commonplace in the following months and was ultimately recognized by the government and brought into law. The Ankara Attorney General stated that they were investigating the possibility of twin suicide bombings. It was observed that an anonymous Twitter account had claimed that an explosion could take place in Ankara just one day before the attack actually happened. The lack of any immediate statement from any known non-state perpetrator taking responsibility for the attack resulted in speculation over the possible perpetrators. Nationalist Movement Party (MHP) leader Devlet Bahçeli stated that the attacks bore a resemblance to the explosion in Suruç in July, raising debate on whether the Islamic State of Iraq and the Levant (ISIL) could have been responsible. It was reported that the type of bomb used bore strong resemblance to the materials used in the Suruç bombing, signalling a potential connection between the two incidents. Veysel Eroğlu, the Minister of Forest and Water Management, made a heavily criticised statement in Afyonkarahisar implying that the HDP had purposely organised the attack against their own supporters to raise public sympathy for their party. Although Eroğlu did not name the HDP or the PKK specifically, he referred to the Diyarbakır HDP rally bombing in June as being an attempt to raise support for the HDP "just so that they can pass the 10% election threshold". A day after the bombing, Davutoğlu suggested that early investigations pointed to the involvement of IS. However, opposition political parties[which?] did not accept this attribution. Yunus Emre Alagöz, an ethnic Kurd from Adıyaman and the younger brother of Abdurrahman Alagöz, the perpetrator of the Suruç bombing, was suspected by the government to be one of the suicide bombers. On 14 October media reports alleged that Yunus, and a second suspect, Ömer Deniz Dündar, both of whom are believed[who?] to have links to ISIL, were identified using DNA from the scene of the blast. On 19 October, one of the two suicide bombers was officially identified as Yunus Emre Alagöz. By June 2016, responsibility for the attack had not been claimed; the Turkish government blamed ISIL. President Recep Tayyip Erdoğan condemned the bombings and vowed that the Turkish people will stand in "unity and solidarity" following the "heinous attack". He also stated that Turkey would not give in to efforts to sow division in society. He encouraged everyone to take responsibility and act with good intentions, claiming that the government was working to uncover the full details of the incident as quickly as possible. Banner at protest in Paris. Note that the word "Ankara" has been written over previous text, indicating the sign has been reused from a protest against a prior terrorist incident. Israel: President Reuven Rivlin sent a letter to his counterpart expressing condolences in which he wrote that he was "saddened to learn of the vicious attacks" and expressed "hopes for a better and more secure future for all the peoples of our region." ^ a b "Does Turkey have to learn to live with terror?". Hürriyet Daily News. 16 March 2016. Retrieved 17 March 2016. ^ a b c NRC Handelsblad, 30 June 2016. ^ a b Melvin, Don (11 October 2015). "At least 97 killed in twin bombings near train station in Turkey's capital". CNN. Retrieved 30 June 2016. ^ a b c "Ankara suicide bomber officially identified as brother of Suruç attacker". Retrieved 19 October 2015. ^ a b "Yunus Emre Alagoz: Brother of Suruc bomber 'identified' as Ankara suicide attacker". Retrieved 14 October 2015. ^ a b NRC Handelsblad, 29 June 2016. ^ "BAŞBAKANLIK KOORDİNASYON MERKEZİ AÇIKLAMASI 11 EKİM – 12:24". Prime Minister of Turkey. Archived from the original on 23 April 2016. Retrieved 13 October 2015. ^ a b "Open Letter to the Government of Turkey on Internet Blocking and Free Expression". Human Rights Watch. 29 October 2015. Retrieved 3 May 2017. ^ a b "Twitter access is effectively blocked across Turkey by means of selective bandwidth throttling - Turkey Blocks". Twitter. 10 October 2015. Retrieved 3 May 2017. ^ "Dozens of casualties in blast at Ankara train station". Anadolu Agency. 10 October 2015. Retrieved 10 October 2015. ^ "At least 20 killed in twin blast in Turkey's Ankara ahead of rally: Report". Hurriyet News Agency. 10 October 2015. Retrieved 10 October 2015. ^ "Twin bombs kill 30 at pro-Kurdish rally in Turkish capital". Reuters. ^ "Ankara explosions leave more than 80 dead – officials". BBC News. ^ "Ankara peace rally rocked by deadly explosions". Al Jazeera. ^ "Powerful blasts rock Ankara peace rally, dozens killed". RT English. ^ "Ankara patlaması Davutoğlu flaş açıklama". İnternethaber.com. 10 October 2015. Retrieved 10 October 2015. ^ "Kılıçdaroğlu'ndan ilk açıklama". MİLLİYET HABER – TÜRKİYE'NİN HABER SİTESİ. 10 October 2015. Retrieved 10 October 2015. ^ "Terör saldırısı sonrası Bahçeli'den ilk açıklama". Haber7. 10 October 2015. Retrieved 10 October 2015. ^ "Accusing PM of 'power vacuum' upon Ankara massacre, CHP-HDP leaders insist on dialogue". Hürriyet Daily News. 16 October 2015. Retrieved 16 October 2015. ^ "MHP leader sees 'security failure' in Ankara massacre". Hürriyet Daily News. 16 October 2015. Retrieved 16 October 2015. ^ "HDP co-chair blames AKP government for Ankara bombings". Hürriyet Daily News. 15 October 2015. Retrieved 16 October 2015. ^ a b "Üç gün 'ulusal yas' ilan edildi". Bugun.com.tr. 10 October 2015. Archived from the original on 21 October 2015. Retrieved 10 October 2015. ^ "CHP'de seçim programı iptal edildi". Demirmedya – Zonguldak için haber. Archived from the original on 12 October 2015. Retrieved 10 October 2015. ^ Yeni Şafak (10 October 2015). "Başbakan Davutoğlu 3 günlük seçim programını iptal etti". Yeni Şafak. Archived from the original on 15 November 2015. Retrieved 10 October 2015. ^ "Başsavcı Kodalak: 2 canlı bomba üzerinde duruyoruz". soL Haber Portalı – güne soL'dan bakın. ^ a b "Ankara bombing: Claims emerge that culprit could be brother of terrorist involved in previous atrocity". Retrieved 14 October 2015. The younger Alagoz brother, of Kurdish origin born in Adiyaman, is believed to have acted on behalf of Isil. The 20-year-old is believed to have gone to Syria last year with his brother, Turkish media reported. ^ AA (7 October 2015). "Terör saldırılarında 93 günlük bilanço: Bin 740 terörist öldürüldü". TÜRKİYE'NİN AÇILIŞ SAYFASI. ^ "Cumhuriyet Gazetesi – Demirtaş: Bu ülkede iç savaş çıkmasına izin vermeyeceğiz". cumhuriyet.com.tr. 10 June 2015. ^ a b "Ankara'daki Barış Mitingi'nde patlama". sozcu.com.tr. 10 October 2015. ^ "Son Dakika Haberi: Ankara'da patlama... 47 ölü iddiası – Milliyet.com.tr". MЭLLЭYET HABER – TЬRKЭYE'NЭN HABER SЭTESЭ. 10 October 2015. ^ "Ankara'daki patlamada acı detay!". sozcu.com.tr. 10 October 2015. Retrieved 10 October 2015. ^ "Ankara'daki Patlamada Korkunç Rakam: Savcı, 52 Kişi Öldü Dedi". Aktif Haber. 10 October 2015. Archived from the original on 11 October 2015. ^ "Ankara'da 3. bomba paniği". MİLLİYET HABER – TÜRKİYE'NİN HABER SİTESİ. 10 October 2015. ^ Nurettin KURT/ ANKARA (10 October 2015). "Ankara'daki patlamada ölü sayısı 86". Hürriyet. Retrieved 7 July 2016. ^ AP Member Choice Complete (10 October 2015). "Two bomb blasts kill 86 at peace rally in Turkish capital". Los Angeles Times. Retrieved 10 October 2015. ^ "Ankara'da terör saldırısı: 97 ölü". NTV. ^ "Ankara'daki Patlamada Ölen 97 Kişi Karanfillerle Anıldı". Hürriyet. ^ "Ölü sayısı 97'ye yükseldi". Aljazeera Türk. ^ "Turkish PM: We lost 99 in Ankara blasts" (in Turkish). Anadolu Ajansı. Retrieved 14 October 2015. ^ "Ankara'daki saldırıda yaşamını yitirenlerin sayısı 100'e çıktı". Sabah. 16 October 2015. ^ "Ankara Bombing death toll rises to 102: Chief Public Prosecutor's Office". Hürriyet Daily News. ^ "Türk Tabipler Birliği: '97 kişi öldü, 400 yaralı'". sozcu.com.tr (in Turkish). 10 October 2015. Retrieved 11 October 2015. ^ "Ölü Sayısı 105'e Yükseldi" (in Turkish). TTB. Retrieved 11 October 2015. ^ "Death toll 106 in suicide blasts: Ankara Chamber of Medical Doctors" (in Turkish). Hürriyet Daily News. Retrieved 14 October 2015. ^ "HDP kriz masası: Ankara katliamında 128 kişi yaşamını yitirdi" (in Turkish). BirGün. Retrieved 11 October 2015. ^ "Düzeltme ve özür" (in Turkish). HDP. Archived from the original on 4 March 2016. Retrieved 13 October 2015. ^ "HDP'den '128 kayıp' açıklaması: Hatalıyız özür dileriz" (in Turkish). Hürriyet. Retrieved 13 October 2015. ^ "Başbakanlık'ın talebi üzerine yayın yasağı geldi". Posta. ^ "Coalition urges Turkey to cease online censorship on eve of elections - Access Now". Access Now. 29 October 2015. Retrieved 4 May 2017. ^ "Twitter ve Facebook'a erişim bu yöntemle kesildi | Teknoloji Haberleri". www.haberturk.com (in Turkish). 13 October 2015. Retrieved 4 May 2017. ^ "ESB: Twitter ve Facebook kapatılmadı Neden yavaşladı?". Hürriyet. 11 October 2015. Retrieved 16 October 2015. ^ "Did Turkey Test Its Wartime Censorship Capabilities?". The Daily Dot. 27 August 2016. Retrieved 4 May 2017. ^ "Ankara explosions leave more than 80 dead – officials". 10 October 2015. ^ "Patlama yerinde bakanlara protesto!". sozcu.com.tr. 10 October 2015. ^ "3. ve 4. bomba ihtimaline karşı anons". takvim.com.tr. ^ "Sağlık Bakanı ölü sayısını 86 olarak açıkladı – Bloomberg HT". BloombergHT. ^ "Başsavcı: İki canlı bomba ihtimali üzerinde duruyoruz". Radikal. 10 October 2015. ^ "Ankara'daki bombalı saldırıyı bir gün önce Twitter'dan yazdı!" [(He/She) wrote Ankara bombed attack one day ago from Twitter!]. sozcu.com.tr (in Turkish). 10 October 2015. Retrieved 10 October 2015. ^ "Bahçeli'den saldırı açıklaması" [Attack statement from Bahçeli]. imctv.com.tr (in Turkish). 10 October 2015. Archived from the original on 12 October 2015. Retrieved 10 October 2015. ^ "2 canlı bomba ve Suruç'un aynısı!" [2 suicide bombers and same as Suruç!]. sozcu.com.tr (in Turkish). 10 October 2015. Retrieved 10 October 2015. ^ "HDP co-leader slams Erdoğan, gov't for attack that claimed 86 lives". Hürriyet Daily News. 10 October 2015. ^ "AKP'li bakan utanmadı: Mağdur duruma düşmek için provokatif eylem" (in Turkish). 10 October 2015. Retrieved 11 October 2015. ^ "AKP'den kan donduran katliam açıklaması: Barajı geçsinler diye" [Gory massacre statement from AKP: (The reason is) Just because (they) pass the (elections) threshold]. BirGun.net (in Turkish). 10 October 2015. Archived from the original on 11 October 2015. Retrieved 10 October 2015. ^ "Cumhuriyet Gazetesi - AKP'li Eroğlu'ndan Ankara'daki patlama için skandal açıklama". cumhuriyet.com.tr (in Turkish). 10 October 2015. Retrieved 12 October 2015. ^ "Ankara bombing: Who is behind Turkey's deadliest attack?". BBC News. 12 October 2015. ^ "Turkey blames Islamic State for Ankara bombings". Retrieved 13 October 2015. ^ "Turkish PM blames Ankara bombing on Islamic State". BBC News. 12 October 2015. Retrieved 12 October 2015. ^ Dearden, Lizzie (10 October 2015). "Ankara explosions: President Erdogan vows Turkey will stand in 'unity and solidarity' after terror attack". The Independent. Retrieved 10 October 2015. ^ "RTE: The Attack was Meant for our Unity". Erdogan. 10 October 2015. Archived from the original on 14 October 2015. Retrieved 10 October 2015. ^ "Cumhurbaşkanı Erdoğan'dan Ankara'daki patlamaya ilişkin ilk açıklama!". Sabah (in Turkish). 10 October 2015. Retrieved 12 October 2015. ^ "Başbakan Davutoğlu: 3 günlük ulusal yas ilan edildi". NTV. 10 October 2015. Retrieved 10 October 2015. ^ a b "Kılıçdaroğlu: "Kim yaptı aydınlatılsın"". CNN Türk. Retrieved 10 October 2015. ^ a b "Kılıçdaroğlu, Davutoğlu'nun çağrısına evet dedi!". sozcu.com.tr (in Turkish). 10 October 2015. Retrieved 11 October 2015. ^ DHA (10 October 2015). "Devlet Bahçeli'den açıklama". HÜRRİYET – TÜRKİYE'NİN AÇILIŞ SAYFASI. Retrieved 10 October 2015. ^ İSTANBUL DHA (10 October 2015). "Selahattin Demirtaş'tan sert açıklamalar". HÜRRİYET – TÜRKİYE'NİN AÇILIŞ SAYFASI. Retrieved 10 October 2015. ^ "PKK ateşkes ilan etti". sozcu.com.tr. 10 October 2015. ^ Murat Sevinç. "Tarih açıklandı: PKK, 11 Ekim'de tek taraflı 'ateşkes' kararını ilan edecek". Diken. ^ "Two soldiers killed in Turkey's east". Hürriyet Daily News. 11 October 2015. Retrieved 17 October 2015. ^ "PKK attack in Turkey's southeast kills one security personnel, injures three". Hürriyet Daily News. 13 October 2015. Retrieved 17 October 2015. ^ "One police officer killed, one wounded in Turkey's southeast". Hürriyet Daily News. 16 October 2015. Retrieved 17 October 2015. ^ "Three soldiers killed in clashes with PKK in Turkey's southeast". Hürriyet Daily News. 17 October 2015. Retrieved 17 October 2015. ^ "Turkish state TV stirs outrage after declaring 'some' Ankara blast victims innocent - LOCAL". hurriyetdailynews.com. ^ "Turkish writer slams Erdogan for chaos". Retrieved 13 October 2015. ^ Elif Shafak (16 October 2015). "A blast that tore at the heart of Turkey's democracy". The Financial Times. Retrieved 18 October 2015. ^ Ishaan Tharoor (13 October 2015). "Watch: Turkish soccer fans boo minute of silence for Ankara terror victims". Washington Post. ^ "Statement by European Council President Donald Tusk on the bomb attack in Ankara". europa.eu. Retrieved 11 October 2015. ^ "Statement by High Representative/Vice-President Federica Mogherini and Commissioner Hahn on this morning's bomb attack in Ankara". europa.eu. Retrieved 11 October 2015. ^ "PRESIDENT SERZH SARGSYAN SENDS CONDOLENCE LETTER TO RECEP TAYYIP ERDOĞAN". President of Armenia. ^ "About the House". YouTube. 12 October 2015. Retrieved 12 October 2015. ^ "Ilham Aliyev expresses condolences to people of Turkey in connection with terrorist attack in Ankara". Vestnikkavkaza.net. ^ "China condemns terrorist bombings in Ankara, Turkey - China - Chinadaily.com.cn". www.chinadaily.com.cn. Retrieved 22 October 2015. ^ "Juan Manuel Santos on Twitter". Twitter. ^ "Comunicado del Ministerio de Relaciones Exteriores" (in Spanish). Ministry of Foreign Affairs. ^ "Anastasiades and Foreign Ministry condemn Ankara attacks". Sigmalive. Retrieved 11 October 2015. ^ "KKTC'de 3 günlük ulusal yas ilan edildi" (in Turkish). Zaman. 10 October 2015. Archived from the original on 11 October 2015. Retrieved 11 October 2015. ^ "Tiskové prohlášení předsedy vlády ČR B. Sobotky k bombovým útokům v turecké Ankaře" (in Czech). Government of the Czech Republic. ^ "Lubomír Zaorálek on Twitter". Twitter. ^ "Egyptian Foreign Ministry condemns Turkey Bombing". ^ Présidence de la République. "Attentat en Turquie". elysee.fr. Archived from the original on 13 October 2015. Retrieved 10 October 2015. ^ "Syriza: 'Erdoğan hükümeti hesap vermeli'". sozcu.com.tr (in Turkish). 10 October 2015. Retrieved 11 October 2015. ^ terra. "Condena Guatemala atentado en Ankara y se solidariza con turcos". none. Retrieved 10 October 2015. ^ "Orbán Viktor együttérzését fejezte ki a török kormányfőnek". Government of Hungary. ^ "Narendra Modi on Twitter". Twitter. ^ "'Iran, Turkey must fight terrorism'". Retrieved 13 October 2015. ^ "Iran condemns Ankara bomb blasts". Press TV. Retrieved 11 October 2015. ^ "We must unite against terror,' Rivlin tells Erdogan after Ankara attack". Times of Israel. ^ "Attentato ad Ankara, Mattarella: "Ignobile attentato"" (in Italian). Il Messaggero. ^ "Lithuania condemns terrorist attack in Ankara". ^ "Malaysia strongly condemns Ankara bomb attacks". The Star. 11 October 2015. Retrieved 11 October 2015. ^ "Press Release on Bombing in Turkey". mofa.gov.np/. MOFA (Nepal). ^ "Pakistan strongly condemns terrorist attack in Ankara". MOFA Pakistan. Retrieved 10 October 2015. ^ a b "10,000 censure Ankara twin blasts". presstv.com. Retrieved 12 October 2015. ^ "Government of Russia on Twitter". Twitter. ^ "Pavlo Klimkin on Twitter". Twitter. ^ "İngiltere Dışişleri Bakanı Philip Hammond. "İngiltere Türk milletinin yanındadır"". Sondakikaturk.com (in Turkish). 10 October 2015. Archived from the original on 4 March 2016. Retrieved 11 October 2015. ^ Yeginsu, Ceylan; Arango, Tim (10 October 2015). "Explosions During Peace Rally in Ankara, Turkey's Capital, Kill Scores". The New York Times. Retrieved 10 October 2015. ^ "US Embassy Turkey on Twitter". Twitter. ^ "Remarks by MOFA Spokesperson Le Hai Binh on the terrorist attack on 10 October 2015 in Ankara, Turke". Ministry of Foreign Affairs. 12 October 2015. Retrieved 12 October 2015. ^ "Turkey: Statement by Defend International President Dr. Widad Akrawi on Ankara attacks". Retrieved 13 October 2015. ^ "Statement by Dr. Widad Akrawi on 2015 Ankara attacks". Archived from the original on 22 December 2015. Retrieved 12 October 2015. ^ Önal, Hasan (11 October 2015). "15 countries issue travel warning for Turkey after suicide bombing in capital". BGN News. Archived from the original on 12 October 2015. ^ "Başbakan Davutoğlu'nun Kayseri Mitingi İptal Oldu" (in Turkish). Bugün. Archived from the original on 15 October 2015. Retrieved 10 October 2015. ^ "Kılıçdaroğlu miting programlarını iptal etti" (in Turkish). Sözcü. Retrieved 10 October 2015. ^ "AK Parti ve CHP programları iptal – Politika – Dünya Bülteni Haber Portalı". Dünya Bülteni. Retrieved 10 October 2015. ^ "Cumhuriyet Gazetesi – MHP'nin İzmir mitingi son anda iptal edildi". 10 October 2015. Retrieved 10 October 2015. ^ Yeni Şafak (10 October 2015). "CHP ve HDP programları iptal edildi". Yeni Şafak. Retrieved 10 October 2015. ^ "Cumhurbaşkanı Erdoğan programlarını iptal etti". Sabah. 10 October 2015. Retrieved 10 October 2015. ^ "Turkey's Erdogan cancels Turkmenistan visit after Ankara blasts: sources". Yahoo News. 10 October 2015. Retrieved 11 October 2015. ^ "'Smiling' Turkish minister should go". presstv.com. Retrieved 12 October 2015. ^ knnimc. "DİSK, KESK, TMMOB, TTB: 12–13 Ekim'de grevdeyiz – İMC TV". İMC TV. Archived from the original on 12 October 2015. Retrieved 10 October 2015. ^ "PKK Eylemsizlik Kararı Aldı". Amerika'nin Sesi. Retrieved 10 October 2015. ^ "Binler Taksim'de katliamın hesabını sormak için yürüyor:". BirGun.net. 10 October 2015. Archived from the original on 11 October 2015. Retrieved 10 October 2015. ^ DHA (10 October 2015). "Ankara'daki patlamaya büyük tepki". HÜRRİYET – TÜRKİYE'NİN AÇILIŞ SAYFASI. Retrieved 10 October 2015. 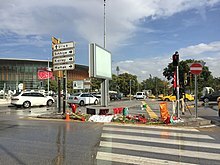 This page is based on the Wikipedia article 2015 Ankara bombings; it is used under the Creative Commons Attribution-ShareAlike 3.0 Unported License (CC-BY-SA). You may redistribute it, verbatim or modified, providing that you comply with the terms of the CC-BY-SA.